The unique 5-visit pass. You pick your days (except July 4th) and enjoy 5 full days of fun at one low price. We think this will be a hit with the economy-minded busy family. Available for purchase at the park or online. Buddy passes at $15.99 expanded to Monday through Friday. Children 3 (after May 25th) and under do not require a pass. 25% Off Lockers and Cabanas any Monday through Friday, except SSR dates. Offer valid at Rentals only on date of use and not available online or for advance reservations. Some restrictions apply. Note: All Admission Tickets are valid for date of purchase only and discount cannot be combined with any other offer. Please note: There is a $4 handling fee for each online transaction. We accept Visa, MasterCard, American Express or Discover cards for payment. Questions? 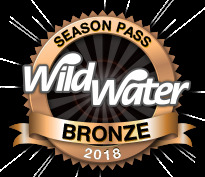 Please contact us at pass@wildwater.net.